Financial institutions include banks, credit unions, asset management firms, building societies, and stock brokerages, among others. These institutions are responsible for distributing financial resources in a planned way to the potential users. There are a number of institutions that collect and provide funds for the necessary sector or individual. On the other hand, there are several institutions that act as the middleman and join the deficit and surplus units. Investing money on behalf of the client is another of the variety of functions of financial institutions. At the same time, there are several governmental financial institutions assigned to regulatory and supervisory functions. These institutions have played a distinct role in fulfilling the financial and management needs of different industries, and have also shaped the national economic scene. Deposit-taking financial organizations are known as commercial banks, mutual savings banks, savings associations, loan associations and so on. Finance companies provide loans, business inventory financing and indirect consumer loans. These companies get their funds by issuing bonds and other obligations. These companies operate in a number of countries. On the other hand, there are insurance companies that provide coverage for a variety of risk factors and they also provide several investment options. Insurance companies provide loans for a number of purposes and create investment products. The functions of financial institutions, such as stock exchanges, commodity markets, futures, currency, and options exchanges are very important for the economy. 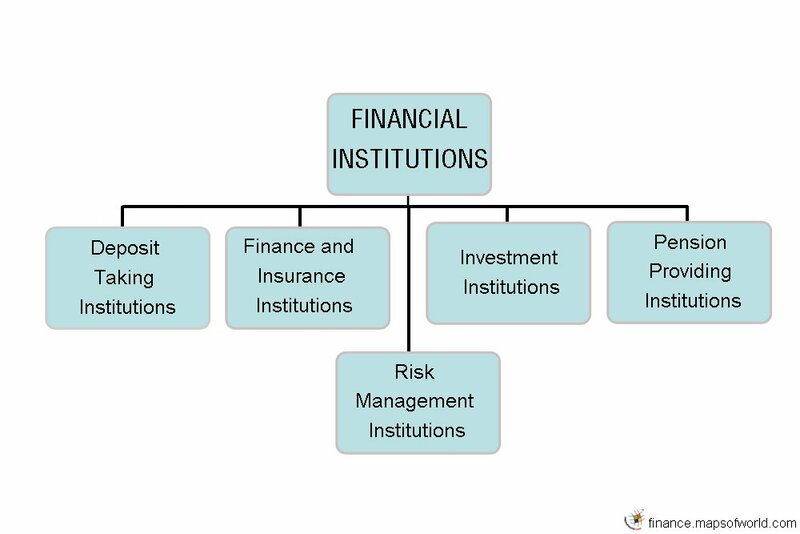 These institutions are involved in creating and providing ownership for financial claims. These institutions are also responsible for maintaining liquidity in the market and managing price change risks. As part of their various services, these institutions provide investment opportunities and help businesses to generate funds for various purposes. The functions of financial institutions like investment banks are also vital and related to the investment sector. These companies are involved in a number of financial activities, such as underwriting securities, selling securities to investors, providing brokerage services, and fundraising advice.